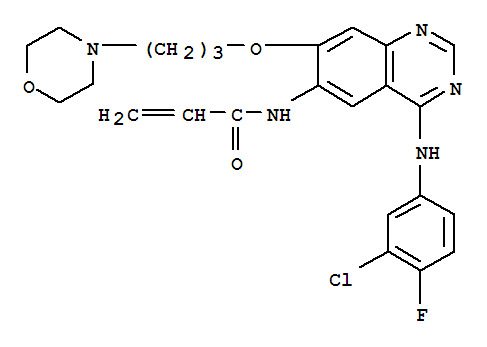 This chemical is called N-(4-((3-Chloro-4-fluorophenyl)amino)-7-(3-(morpholin-4-yl)propoxy)quinazolin-6-yl)prop-2-enamide, and it can also be named as Canertinib [INN:BAN]. With the molecular formula of C24H25ClFN5O3, its molecular weight is 485.94. The CAS registry number of this chemical is 267243-28-7. Additionally, its classification codes are Antineoplastic; Epidermal Growth Factor Receptor (EGFR) Inhibitor. Other characteristics of the N-(4-((3-Chloro-4-fluorophenyl)amino)-7-(3-(morpholin-4-yl)propoxy)quinazolin-6-yl)prop-2-enamide can be summarised as followings: (1)ACD/LogP: 2.15; (2)# of Rule of 5 Violations: 0; (3)ACD/LogD (pH 5.5): 0.32; (4)ACD/LogD (pH 7.4): 1.88; (5)ACD/BCF (pH 5.5): 1; (6)ACD/BCF (pH 7.4): 13.72; (7)ACD/KOC (pH 5.5): 5.21; (8)ACD/KOC (pH 7.4): 190.31; (9)#H bond acceptors: 8; (10)#H bond donors: 2; (11)#Freely Rotating Bonds: 8; (12)Polar Surface Area: 71.03 Å2; (13)Index of Refraction: 1.649; (14)Molar Refractivity: 130.74 cm3; (15)Molar Volume: 358.4 cm3; (16)Polarizability: 51.83×10-24cm3; (17)Surface Tension: 61.3 dyne/cm; (18)Density: 1.355 g/cm3; (19)Flash Point: 371.7 °C; (20)Enthalpy of Vaporization: 101.26 kJ/mol; (21)Boiling Point: 691 °C at 760 mmHg; (22)Vapour Pressure: 6.08E-19 mmHg at 25°C.